Sounds like another Shale Experiment. So, how many square feet do guinea pigs need? Just watched the P&Z meeting. So, this community also gets a cell phone tower??? Is this an added amenity? Wow. Talk about an environmental disaster. Perhaps they should just build the homes around the frac pond so everyone can enjoy a lakeside view. Yes. Apparently for 30 years...agree that maybe they should leave the FRAC Pond in place as an amenity, too. 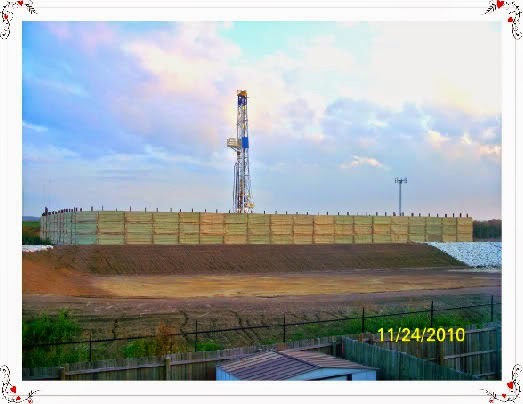 Then they can have watch parties for the methane leaks that will surely happen and for any seismicity that can occur with all those millions of gallons of water sloshing around down there with a potential to cause earthquakes right next to the Joe Pool Lake Dam. I happened to watch the Grand Prairie City Council meeting last night. It seemed rather peculiar that one of the council members would ask the citizens who spoke in opposition whether they would prefer a housing development OR commercial on that site when neither is an acceptable option. That was the WRONG question since there is a gas well on that property. There will ALWAYS be a gas well on that property. The only moral/ethical thing to do with that damaged land is to leave it as a green space or perhaps set up a memorial so people can remember what a debacle the shale boom was. And Holy Cow!! Where did they find that developer ~ on Craigslist??? He didn't even have a clue as to the price of the homes he plans to build. What are his credentials? He didn't present any photos of his other homes or blueprints for this planned development. If he can pull off selling homes by a fracked, plugged gas well near a dam spillway and a telecommunications tower, then I've got some ocean front property in Arizona for sale.